A simple soup supper in the parish hall shared with friends begins our evening celebration of Maundy Thursday. This service commemorates Jesus’ last meal with his friends, the institution of the Lord’s Supper, and Christ’s commission to serve. 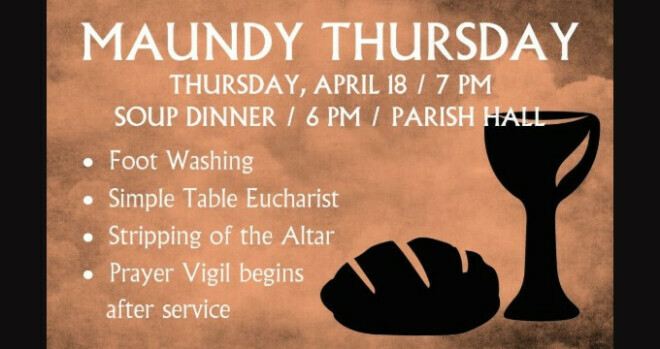 It begins with the fellowship of an evening meal, continues with a gospel reading and the ritual of footwashing, and concludes by preparing the church for Good Friday. After the stripping of the altar, the reserved sacrament will be carried to the altar of repose for the All-Night Vigil. A nursery is provided for this service. The Rev. Dorcie Dvarishkis preaches. An overnight silent vigil of prayer and meditation before the reserved Sacrament concluding at 7am on Good Friday.